Click here to go to our main page on group delay. And cut us some slack while we get this page up and running! 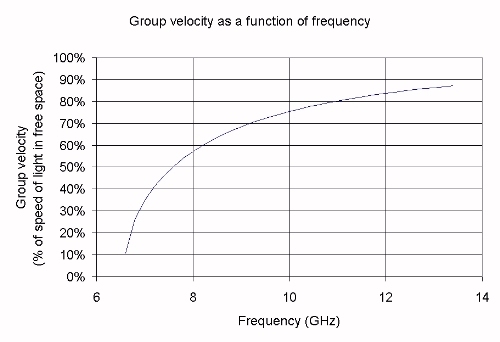 Group delay of waveguide components is a function of the frequency you are applying. Near the lower cutoff, the group delay gets longer and longer, as the EM wave ping-pongs down the guide, and can easily be 10X the free-space group delay. But at the upper end of a waveguide's band, the group delay approaches the free-space group delay. Group velocity in a waveguide is speed at which EM energy travels in the guide (which is slower than free space). Equation is... and plotted below, we see it varies tremendously across the band for WR-90 (X-band) waveguide.